One look at the Indian Pharma companies today and you will conclude that their biggest challenge is not the competition, but US regulator (US FDA); the industry's 'devil incarnate' if you will. All big names. All been slapped by the US regulator. What is the issue, really? Why are all these big companies failing to comply with US FDA norms? Clearly, the fault is theirs. But maybe, just maybe, it could be that the US FDA has upped its standards, and Indian companies, used to a certain way of doing things, have failed to keep up. If you are an optimist, you can look at these developments as a wake up call for Indian Pharma to pull up its socks. An opportunity for the industry to raise its standards once and for all so these incidents are not repeated. Indeed, the US regulator can visit the plants anytime, and that too as surprise visits. So the companies don't always know when an inspection will take place. The idea is to maintain high standards at all times. For my team of pharma analysts, it is a tough job. It is practically impossible to determine which pharma company will come under the US FDA lens next, and whether any 'observations' will take a more serious form - warning letters. What the team can do - and is doing - is get a sense of how recent the visits from the US regulator have been. And make assumptions based on that. A lot also depends on the wording in these USFDA letters. So once the pharma team gets an observation or warning letter, the trick is to figure out how serious the issue is. And adjust the estimates accordingly. For us, every USFDA problem is not a trigger for selling a pharma stock or staying away from it. We do not necessarily look upon these developments as a 'management' issue. If the company has a robust product pipeline, a strong presence in the markets it is present in, and healthy financials, we have no qualms about recommending pharma stocks, if the valuations are really attractive. The US FDA issues will get resolved over time. But the issue becomes really grave if the wording points to 'the management intending to deceive'. That's when we would prefer to steer clear of such companies. Thankfully, the only company which was charged with such a serious allegation was the erstwhile Ranbaxy. Warren Buffett would agree with us. At one point his Berkshire Hathaway had a stake in global pharma giant GSK Plc, but then sold off the entire stake in 2014. At the time, GSK Plc was going through a bad patch and had reported poor growth in sales and profits. But that was not what prompted Buffett to sell the stock. He was concerned about the company being embroiled in a case of bribery in one of its overseas markets. And that was as good a reason as any for him to exit. So you see, while US FDA issues are a serious dampener for Indian pharma companies, we believe that one should not shun the industry entirely solely because of these issues. Unless there are serious charges of deception or other wrongdoings involved. 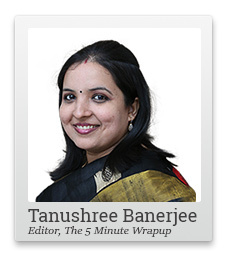 Editor's Note: Tanushree's team, as you probably already know, promises to recommend stocks that will grow steadily and safely. If you want to know exactly where you should put your retirement money, for example, this service is your answer. Learn more here. Does This Chart Indicate Beginning of Capex Cycle Recovery? A high level of Capital Expenditure (capex) is believed to be a good indicator of economic growth. When we talk about the Indian economy, however, the capex has been on the decline since 2011. Unfortunately, when there were signs of a rising growth curve, disruptions like demonetization and GST came in. However, the chart below offers a few reasons for hope. Credit-deposit ratio, a.k.a. CD Ratio has been steadily increasing over the past one year. This ratio shows how much a bank lends out of the deposits it has mobilized. This ratio was below 70% in November 2016, when demonetization resulted in a flood of deposits while lending slowed down. Deposit growth and bank credit growth impacts the CD ratio. Bank credit growth rate is continuously improving and achieved 9.6% growth in November 2017. Although the base effect may have played a part in making, the current growth numbers look better. Nevertheless, the rise in bank credit growth will be positive for India's banking sector facing lower loan demand and severe capital constraints. Over the past five years, private capex was stalled because of high leverage and weak capacity utilization levels. However, the above chart shows early signs of revival of capex cycle. We are seeing the early signs of revival in the capacity expansion of the private sector. The pertinent question here is, which company is set to benefit the most from such capex plans? It's neither a bank nor an engineering, cement, or steel company. Rather, it's a company that is riding the tailwinds of a megatrend that The India Letter team has identified. What's more, the usually overpriced stock is currently near 52-week lows. Click here to know more about the company. Brent crude futures, the international benchmark for oil prices, touched US$65 on Tuesday. This was a consequence of the Forties North Sea pipeline shutdown which knocked out a significant supply from a market. However, by the end of the day, oil prices fell sharply as traders took profits after prices surged to a two-year high. The market already saw a tightening supply due to the OPEC-led production cuts. The OPEC is expected to extend a cut of approximately 1.8 million barrels per day through 2018. Since June 2017 onwards, prices of Brent have been on the rise, after a drop in US crude inventories, geopolitical tension between OPEC countries, and the disruption in production caused by the hurricane activity in the US. Nevertheless, the rising oil price is not good news from India's perspective. Fiscal revenues are at risk. Particularly if the government is forced to consider a cut in fuel excise duties due to a rally in oil prices. In recent times, a sharp jump in excise collections has helped indirect tax collections. Any risk to revenues and subsequent threat to the fiscal deficit target at 3.2% of GDP would require tighter spending cuts. Not to mention, low crude prices were a positive growth impetus through higher discretionary incomes for households and lower input costs for manufacturers and farmers. Part of this benefit is likely to be eroded as retail fuel costs rise. As for corporations, expansion in gross margins caused by falling commodity prices is also likely to wane, pressurising profitability. From India's perspective, rising oil prices warrant close attention. Higher prices will impact inflation. This pressurises the monetary policy. And, if crude oil prices remain high, there will be a change in the trade dynamics affecting the trade deficit, which will influence the direction of the rupee's movement that's presently quite strong. Indian equity markets opened the day in the green. At the time of writing, BSE Sensex was trading higher by 45 points and NSE Nifty was higher by 20 points. Both the mid cap and small cap indices are trading up by 0.3% and 0.2%, respectively. Stocks from the consumer durable and capital goods are among the gainers. The US Federal Reserve's decision to raise interest rates to a range of 1.25% to 1.5% and follow it up with further rate hikes in 2018, is expected to weigh on market sentiments in coming sessions. Equitymaster requests your view! Post a comment on "Why You Shouldn't Shun Pharma Stocks...". Click here!